A CBC story on the new all-women Allegra Chamber Orchestra describes it quite rightly as one of the few all-female orchestras in the world. That story provides a convenient reason for me to turn the spotlight on a forgotten woman musician who formed one of the first all-female orchestra back in the 1930s, and who later became the first woman to conduct in London's Royal Festival Hall. Kathleen Riddick was born in 1907 and studied at the Guildhall School of Music and the Salzburg Mozarteum. In the 1930s she formed the London Women's String Orchestra which later became the multi-gender Riddick String Orchestra. The BBC onlinearchive gives details of a 1939 broadcast by the London Women's String Orchestra of arrangements of Rameau, while the Riddick String Orchestra was active until shortly before its founder died in 1973. 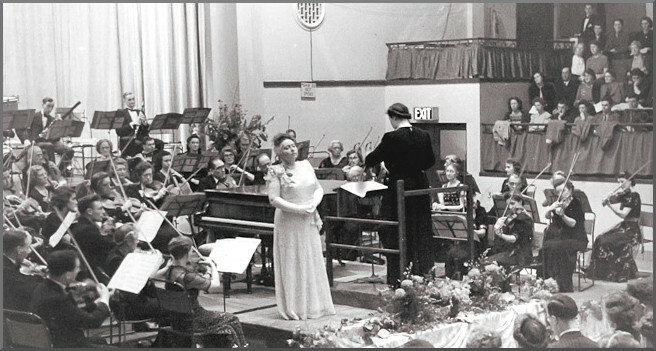 The Riddick String Orchestra was held in high esteem, and in 1951 Kathleen Riddick conducted it with Dennis Brain as soloist in the premiere of Gordon Jacob's Horn Concerto in the Wigmore Hall. Her colleagues and players regarded her as a thoroughly professional music director, and she is remembered not so much as Britain's first successful woman conductor, but simply as a good conductor. * I grew up in Surrey and the very first classical concert I attended was in Epsom Baths Hall in the 1950s when the Surrey Philharmonic played Holst's The Planets. Header photo taken is from the orchestra's archives. Any copyrighted material is included as "fair use" for critical analysis only, and will be removed at the request of copyright owner(s). Also on Facebook and Twitter.